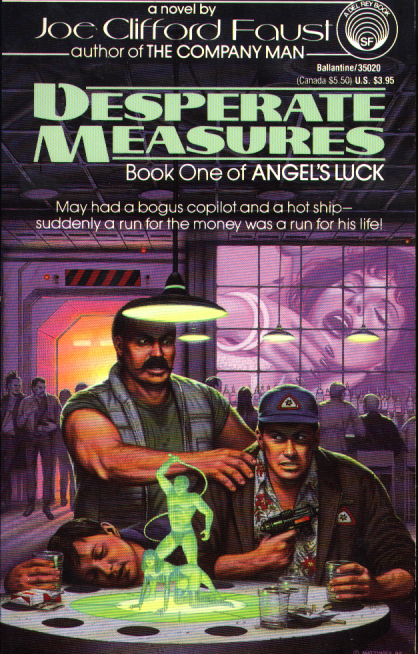 Most recently, Sci-Fi Undercover has discussed the book Desperate Measures by Joe Clifford Faust. On a whim, I decided to e-mail the cover artist for the novel, David B. Mattingly, to see if he would answer some questions–and everything turned out better than expected. David B. Mattingly has illustrated over 500 science fiction and fantasy covers during his career and some, like the Honor Harrington series, were not strangers to the NY Times Best Sellers list. He has worked as a matte artist for many years and you can check out his illustration guide, The Digital Matte Painting Handbook, on Amazon.com. I wish I had the skills for it! Currently, Mattingly teaches craft at both The School of Visual Arts and Pratt Institute in New York City. Below, the (5 question) Q & A session is reproduced in full. My questions are in italics along with any editorial clarifications I make. No changes have been made to Mattingly’s text beyond formatting. I would like to excessively thank David B. Mattingly for his time–this has been an incredible experience. Question 1) My decision to read Joe Clifford Faust’s Desperate Measures was based entirely off of the cover art, and you have produced over 500 covers in your career. Have you ever thought about how much your work corresponds to books sales and notoriety for an author or novel? Do you think science fiction and fantasy cover artists get appropriate credit? Mattingly: “I know that when I do a good cover for a book, it will probably sell better than when I do a mediocre cover. I certainly always try to do great work, but over the course of a year, I will generally go one or two top-notch covers, 12 or 14 reasonably good one, and one of two that are not up to my general quality. It is hard to control what will come out great, since it is partly due to artistic inspiration. It is true that if I allow more time for an important book, I can skew the odds of doing something better, but sometimes a book just appeals to an illustrator, and a great picture jumps out for the cover. As for Joe Faust’s book, I was assigned his first book, A Death of Honor to do, I loved it, and I actually wrote him a fan letter telling him how much I enjoyed it. We wrote back and forth, and actually met up and had dinner once in New York city. So we became friends in the course of working on the book. The cover came to mind pretty quickly, without having to agonize over it. By the way, the guy lying drunk on the bar (in the cover of Desperate Measures) is the author, Joe Faust. I asked him to photograph himself so I could use him as the model. It is an “in” joke, since Joe is actually a committed christian, and anything but a drunk. He was a good sport and sent me the photos of himself to use as reference. The book (A Death of Honor) did reasonably well for Del Rey Books, so I got the chance to do Desperate Measures. I should mention that part of the inspiration for that cover was the work of one of my favorite comic artists, Joe Kubert. In Joe’s work, the storytelling is so strong that you always have to speculate about what happened a moment after that image happened, and I think I did that with Desperate Measures. You can’t help but wonder what happened 5 seconds after this image. 2) I would like to talk a little more about your work with Joe Clifford Faust, specifically. Is there any insight you can give into the relationship between cover artist and author? Can you recall how much conversation you had with Faust before you began your work, or how much detail a cover artist and author typically discuss? Mattingly: “Generally the cover artist and author have no conversation at all. In fact, as an illustrator, if you contact the author, and the book company doesn’t know about it, you can get in trouble for it. The reason for that is actually pretty clear–the author has worked for months, or even years on the book, and often has a very specific vision of what the cover should be. However, for the publisher, the cover is a selling tool–you need to get people to buy the book, and their vision of what makes a good cover for the book, and what the author thinks may be different. So if you contact the author, and suddenly they are dictating what the cover should be, you can be caught between a rock and a hard place with the publishing company. I always ask the publisher before I contact an author, just to keep clear of the politics of the cover. Some publishers, like Baen Books, are totally cool with you contacting authors for more information, as long as you understand that the final word on the cover comes form the publisher, not the author. The publisher has to sell the book, and if the author has a different vision for the cover, it is still the publishers call. So the long and short of doing the covers for Joe Faust is that he was totally cool about not trying to dictate the covers, but helped me out to make the covers as accurate as they could be. 3) You have worked on some hugely successful franchises during your career, and I will name Animorphs and Honor Harrington as examples simply because they were favorites of my youth. Was there a significant difference between your work on these projects compared to a smaller publication, like Desperate Measures for example? What kind of publication did you typically enjoy the most? Mattingly: “Actually, I wouldn’t call Desperate Measures a small project. It was published by Del Rey Books, the premier publisher of the day. But I know what you mean–David Weber’s book constantly hit the NY Times best seller list, so there is some real gravity when I start doing a cover for him. But the truth is I basically put myself in the same mind space for every cover I do–I always want to do something wonderful that attracts the reader’s interest, and also reflects the authors intent, if possible. An artist with friends. Image links to biographical page. 4) In your website’s biography, you mention your transition to digital illustration. Many artists have had trouble with this, and I wonder what do you think enabled you to be successful? Is there anything from your older methods and mediums that you miss? Mattingly: “I miss a lot of things about painting traditionally. There was magic in putting paint on a canvas, and that is lost when I work digitally. However, when working digitally, I have access to some of the most wonderful tools an artist could ask for, so it was worth if for me to make the chance. I still love to paint traditionally when I am on vacation, but when I am doing professional projects, digital is the medium for me. Mattingly’s essay, Everything I Know About Being a Digital Artist, is reproduced here with permission from the author. The link is to a document viewer that requires no downloading or anything besides a click from your mouse. 5) For authors and publishers, the digital age has meant tremendous upheaval with still an uncertain future to come. The rise of e-books and self-publication has more permanency than a trend. What do you think this means for cover artists—those who are getting out of school now, and want to do exactly what you have done for a career? Do you have any idea what this profession might look like in the future?